I hope everyone had a wonderful weekend, whether you were celebrating Derby Day, Star Wars Day, or like most 20-somethings in the Boulder/Denver area, Cinco de Mayo! This happened to be one of the first beautifully hot days Boulder's seen so far this year, so friends and I headed to Denver for some authentic Mexican cuisine and dancing at a nightclub nearby. 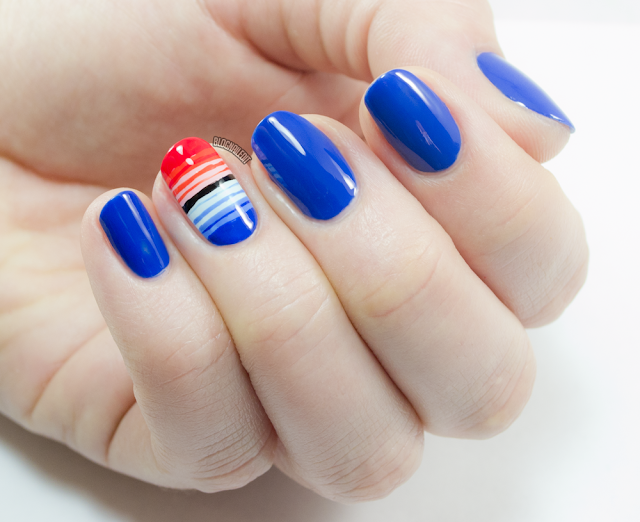 The morning of Cinco de Mayo, I wanted to wear some festively bright colors, so I did a little accent nail in one of the most recognized patterns of Mexican culture, the sarape. Though the shawls come in different patterns and colors, I picked a brightly colored striped pattern for my accent. I even attempted and mostly pulled it off on my right hand's ring finger, but I'll save you from having to see that Cinderella finger. This is absolutely gorgeous, it looks so summery!